In the latest proof that the oceans continue to offer remarkable findings and much of their vastness remains to be explored, scientists at Scripps Institution of Oceanography at UC San Diego and their colleagues have discovered a unique bioluminescent eye-like creature in the depths of the ocean. The discoveries feature an brand new species that produce a brilliant green and blue bioluminescent display. Largely transparent except for the gut area, the create propels itself with a series of long thing spike shaped appendages that glow an aqua blue. I also has eight tentacle like appendages likely used to hunt. While sharing many characteristics of jellyfish it's eight legs give clues to it being related to cephalopods similar to squids and octopi. 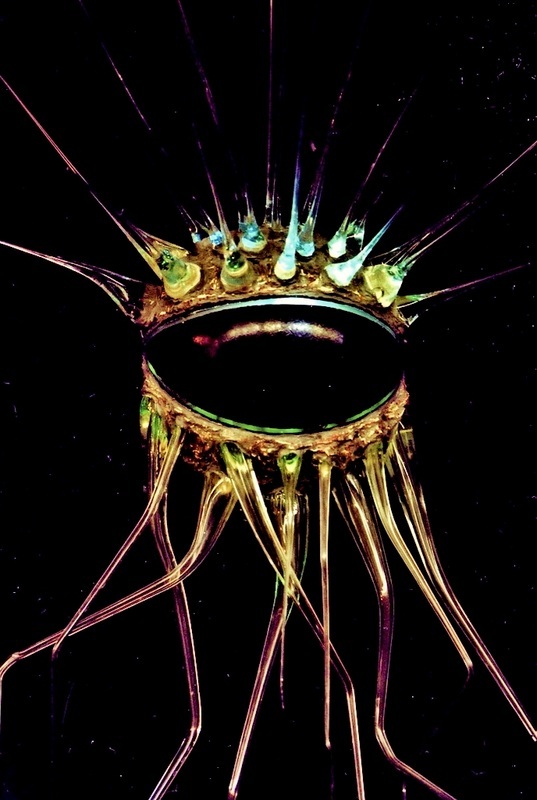 The most striking characteristic of this new creature is the large eye-like shape of it's body. With no other apparent optical organs it is believed that the front of the body acts as way off navigation and hunting. The challenges faced by animals living in a three-dimensional open water habitat above the seafloor are very different than those faced by animals living on the seafloor. These include locating new food sources, finding ways to maintain optimal depth and grappling with predators that come from various directions. The team hoped to answer such questions but their time with this new creature was short lived. The picture below are the only pictures the teams ROV submersible was able to capture of this new creature. The team easily spotted the new species from a distance with it's brilliant bioluminescent display. It appears they the creature also spotted the teams ROV and headed straight over to investigate it leading scientists to believe it could posses high level intelligence found in other cephalopods. As soon as the team turned on it's external lights to take the photo below the creature fled and was not able to be relocated. It is suspected that the creature is able to turn off it's biluminescence to hide and become relatively invisible as it perhaps continued to obverse the ROV from a distance undetected.